I was recently contacted by Finella, the grand-daughter of the owners of Brims Castle when my Grandfather visited there in 1909. 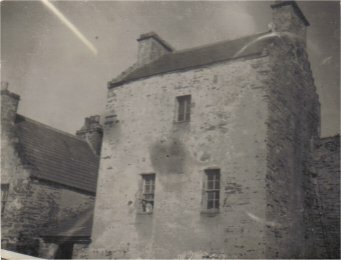 Here is the picture he took, and put in "The Brimses of Brims" labled " The actual entrance to the old castle at Brims. 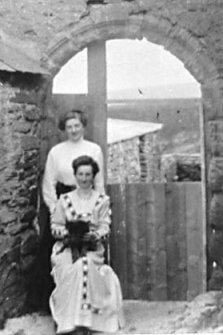 Mrs Begg the young farmers wife at the front sitting and a friend of hers behind"
Donald (Dan) Begg had Brims Farm and renovated the castle prior to his marriage in 1910 to a daughter of the Manse of Reay. 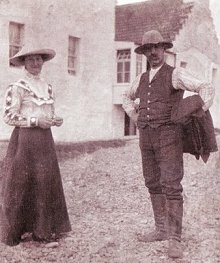 Finella's late mother and aunt were both born there - 1913 and 1916 - but the family moved to another of his farms - Pennyland, near Thurso - around 1917 so that they would be nearer schools. She used to go to Brims with her grandfather when she was 3 or 4 years old. He sold it around 1947/8 and died the following year, having retired to Reay in 1944. Donald's wife (pictured right) died in 1924 from flu and pneunomia. 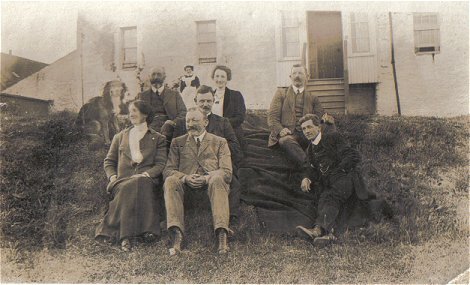 Below, accompanying the poem are some more pictures from Finella of her grandparents and family at Brims Castle. The following poem was written by Henry Henderson, known as the Bard of Reay for Mr Begg in 1909 because he was so happy that the castle had been restored was was being lived in again. On the shingle down below. With wreckage bestrewed the shore. To the rhythmic sound of the sea. That the living have to go. And listened to the sound of the sea. And long in it may he reign.